Norway’s finest purveyors of indie-pop, Team Me wowed everyone they come across a few years ago with their phenomenal self-titled debut EP and jubilant live show. That they followed this up with the incredible album ‘To the Treetops!’ in 2012 was something every music fan jumped for joy at. 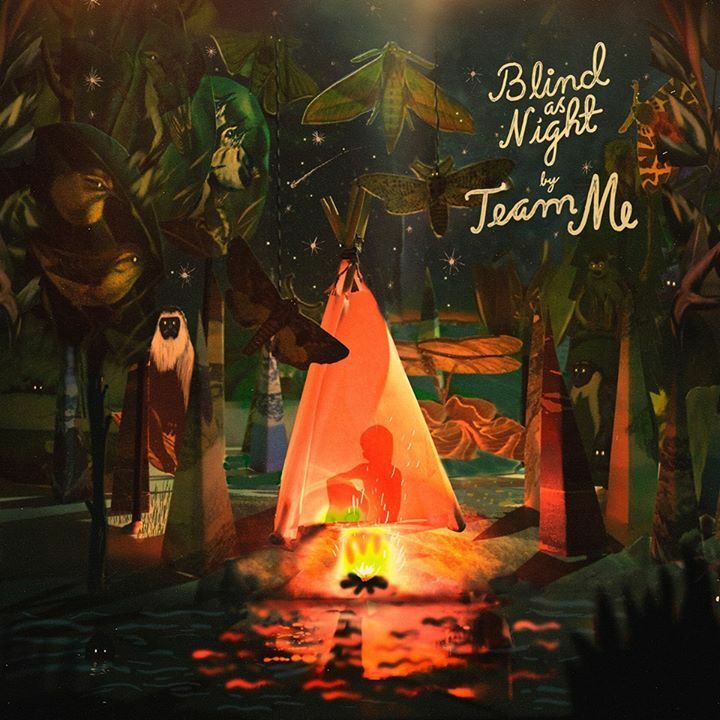 Following this up with the more introspective ‘Female Lead’ EP it seems we’ve been waiting a while for the second long-player – but now ‘Blind as Night’ is here and it’s glorious. As with ‘To the Treetops!’, Team Me open with a song clocking in at over 8 minutes and starting with the words ‘Riding My Bicycle’ –you already know you’re in for a treat as their childlike enthusiasm for all things pop grapples with their more mature melodic sensibilities. This time around, the band is heading from ‘Feddersensgate to Møllerveien’ and it’s just as exciting as their previous journey. Psychedelically tinged, the song has moments of electronica mixing in with the dreamy acoustics and then the first yelp of ‘HEY!’ almost welcomes the band back into the fold. It feels like they’ve never been away – although this time they seem to be more wary as all band members sing in unison: ‘Release me and send me off to a place quiet and desolate” before changing their attitude and beckoning you to: ‘Let my songs lead the way’. ‘Kick & Curse’ finds the band back in more traditional territory as far as soundscapes go, but the lyrics hint at a selfish sense of regret previously only hinted at: ‘So much easier to leave than being left alone’. It appears to be about leaving someone in the lurch but as soon as the decision is made, regrets come flooding in. Talk of sleepless nights is joined by the confession: ‘I’ll even admit that I was wrong to let you go’ and the repeated, group-sung refrain of ‘You knocked me to my knees, now I’m on the floor with a pack of wolves outside my door’ is made for group sing-alongs. ‘F is for Faker’ was the lead single and could act as a sibling to their live favourite ‘Dear Sister’. The music sounds like the Polyphonic Spree buzzing on E numbers while the handclaps just add to the ridiculously joyous nature, although the subject matter does seem somewhat darker: ‘F is for Faker, I’m leaving him for you’. Orchestral, harmonious vocals and a timeless melody swirl around to great effect while the backing chants of: ‘One of a kind, you’re one of a kind’ are ultimately uplifting. ‘Le Sound’ is the stadium-sized song that combines Mew-style grandiosity with Broken Social Scene’s heartfelt nature (and perhaps a bit of Coldplay anthemics…). Slotted right in the middle of the album, it’s full of beautiful moments – when Marius Hagen and Elida Inman sing: ‘You find a hidden song in all this wretchedness’, it’s one of those moments in music that takes your breath away. Similarly, ‘Are You Still in Love?’ acts as a celebration of all things romantic: ‘My heart jumps for joy when I’m with you’. Meanwhile, ‘Did We Lose Something Here’ falls very much into a more contemporary sound with hints of Dutch Uncles in the introduction especially. A song about making the most of things even if you have to erase everything that came before – in ways like burning notes – it’s one where you can hear the energy and emotion surging from your speakers: ‘Did we lose something here? Are you scared? Can we go back to start?’ Elida also has a very touching moment on ‘Steven’, a personal song that has a very minimalistic feel compare to the rest of the album. There won’t be a dry eye as she talks of ‘previous suicides’ and demands ‘get well’. The penultimate track ‘The All Time High’ sounds for all the worlds like Wild Beasts doing Disney – and it’s absolutely wonderful. Bursting with hope, delight and elation, it goes from stating how: ‘Young love like ours will not survive this night’ before doing a back-turn and gleefully singing how ‘It’s glowing through our veins’ and ‘The true sensation – the all-time high!’ It’s the perfect climax, but Team Me do things differently and after the unabashed glee this song brings, they tone things down on the closing title track. A more experimental nature takes hold as menacing drums act as a bed to alarming lyrics like ‘Put me to sleep, take off all my clothes, my body is burning’… It’s an unexpected finish but one that makes sense in the context of an album that seems to be full of observations of past mistakes. However, make no mistake yourself; this is an album that deserves to be listened to loud and time and time again. The band may claim: ‘There’s no place to hide’ but we wouldn’t have it any other way. The more we see and hear of Team Me, the better!